Malcolm Bedell of the food blog "From Away" and the newly funded sandwich truck, 'Wich, Please, will be making sandwiches in Rockland starting in the spring. 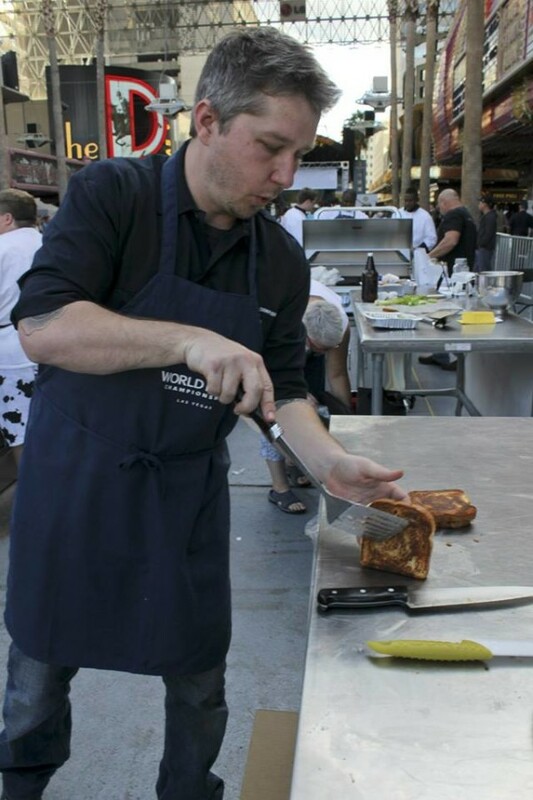 Here, he's making a grilled cheese at last year's World Food Championships in Las Vegas. ROCKLAND, Maine — The ’Wich, Please sandwich truck should be rolling in to Rockland early next spring after an online fundraising effort exceeded the hopes of food blogger and avid home cook Malcolm Bedell. He had needed to raise $25,000 by 6 p.m. Friday through the online entrepreneurial fundraising site Kickstarter in order to receive any of the money pledged by his backers. Although Bedell described the beginning of the final week of fundraising as “terrifying,” because he had so much money left to raise, by Friday evening everything had changed. By the time the deadline rolled around, 401 people had invested $29,457 in Bedell’s start-up. That makes ’Wich, Please, the 7th-most funded food truck in Kickstarter history. The top six food truck projects all were located in much larger cities, including New York City; Boulder, Colorado; Baltimore and Oklahoma City. Bedell, who moved with his young family last winter from Rockland to Burbank, California, can’t wait to move back home. He said that he has a lot to do in the next few months. After checking off his comprehensive to-do list, Bedell, whose previous day jobs have been in marketing, said he hopes the truck will be open and serving sandwiches in the spring. The ’Wich, Please, truck will be parked in a yet-to-be determined location for the summer, and likely a different one for the winter months. Bedell said that he aims to serve creative, delicious sandwiches for no more than $6 or $7 each. The “From Away” food blogger said earlier this month that he has been writing and talking about food in Maine for long enough. “It’s time to stop talking and jump into the ring and see if we can make it,” he said.